If you’re not comfortable with ordering online we totally understand – you can also call Lynch Creek direct toll-free at 1-888-426-0781 and please Lawrence Central Rotary Fundraiser #100925. 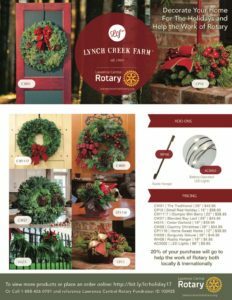 Lynch Creek is a family business that started in 1980, now transformed from selling a few flowers and vegetables at the local farmers’ market on the weekends, to a full-blown year-round business that ships throughout the United States. 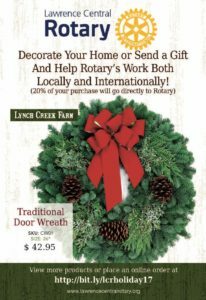 Lynch Creek Farms have been amazing to work with and they care about the groups that sell their wreaths and decorations. Here’s a video about the business. 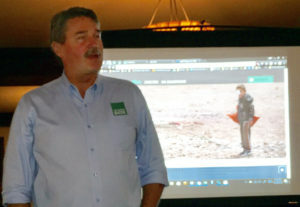 Leawood Rotarian Jeff Deatherage spoke to Lawrence Central Rotary about ShelterBox USA and his role as a Response Team member. The ShelterBox organization is an international nonprofit effort to provide shelter and vital supplies in response to disasters and humanitarian crises. The program is most known for the distinct green plastic boxes containing tents, blankets, ground covers, water storage and purification devices, solar lamps, cooking supplies, a basic tool kit, mosquito netting, and a children’s activity kit. ShelterBox response is tailored to each unique situation as only the supplies that are needed are distributed. The idea for the program was developed by a local Rotary Club in Cornwall, England in April 2000. This project was quickly adopted by other clubs and has grown into an organization with twenty international affiliates. ShelterBox has responded to 270 disasters in 95 different geographic locations and served over one million people. Jeff explained the work requires considerable coordination and communication with local officials and other aid providers. The world -wide network of Rotary is heavily depended on to accomplish deployments of supplies. Presently, ShelterBox has representatives and assistance on the ground in Syria in preparation to assist 300,000 civilians trapped in Aleppo by fierce fighting. Jeff explained that his role as a ShelterBox Ambassador involves periodic training and a willingness to deploy for two weeks each year. Jeff has deployed to Paraguay for flooding, the Philippines after a tsunami, and twice to Oklahoma for tornado relief. He makes numerous speaking engagements each year and often sets up demonstration tents and supplies as he did for the fall LCR Community Bike Ride. He thanked LCR for past support of ShelterBox and presented the club with a Shelter Box Hero award. 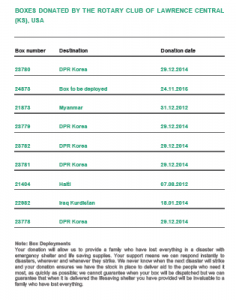 More information is available at shelterboxusa.org. Lawrence / Douglas Country Community Health Planner Charlie Bryan was on hand showing attendees the proposed “Lawrence Loop” bike / multi-use path. LiveWell Lawrence and partners continue to advocate for finishing this 22-mile loop trail around Lawrence everyone could enjoy. Exciting for both local Rotarians as well as attendees to see was an assembled ShelterBox which Lawrence Central Rotarians have heavily supported over the years. A ShelterBox is a simple and effective solution to deliver the essentials people need to survive and begin to rebuild their lives in the aftermath of a disaster. ShelterBoxes are tailored for the particular disaster being responded to, but typically includes a disaster relief tent for a family, thermal blankets and groundsheets, water storage and purification equipment, solar lamps, cooking utensils, a basic tool kit, mosquito nets and children’s activity pack. Thanks to all our sponsors and volunteers who made this happen! One of the great things about Rotary is the ability to help people both locally and globally. 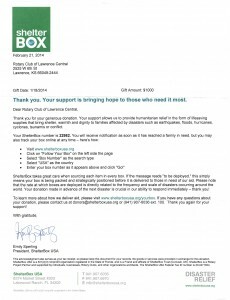 One of the global causes that the members of our club very much rally behind is ShelterBox. ShelterBox provides emergency shelter and vital supplies to support communities around the world overwhelmed by disaster and humanitarian crisis. When families are in need of emergency shelter, they will do everything we can to help them. Click Here earn more about shelterbox’s work. Since ShelterBox was founded, they have responded to over 240 disasters and humanitarian crises in more than 90 different countries and provided emergency aid for well over one million people. The ShelterBox solution in disaster response is as simple as it is effective, delivering the essentials people need to survive and begin to rebuild their lives in the aftermath of a disaster. 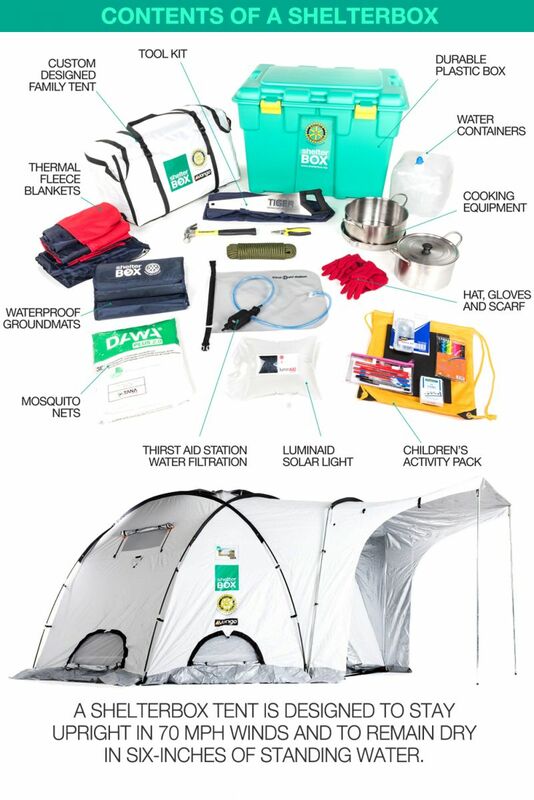 ShelterBox aid is tailored to a disaster and typically includes a disaster relief tent for a family, thermal blankets and groundsheets, water storage and purification equipment, solar lamps, cooking utensils, a basic tool kit, mosquito nets and children’s activity pack. To date Lawrence Central has been worked to donate 9 ShelterBoxes that have provided disaster relief in Korea, Myanmar, Haiti and Kurdistan. If being a part of a service organization that helps people both locally and globally is interesting to you contact us or come to one of our weekly meetings on Wednesdays and noon in the Eldridge Hotel’s All American Room. 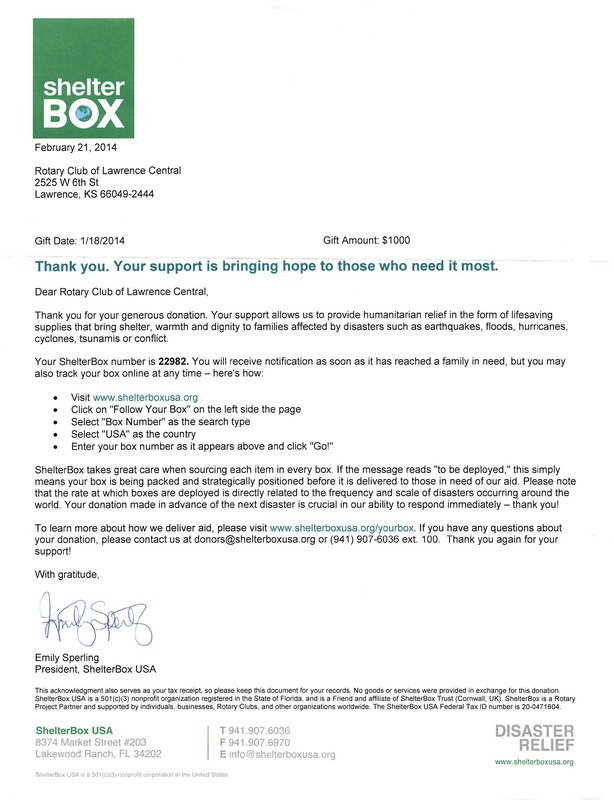 We got a note back from Shelterbox USA that they received our donation of $1000 for another shelterbox. The letter has the serial number of the box so we can track where it went to help people in times of disaster. If you don’t remember Shelterbox responds instantly following natural and other disasters by delivering boxes of aid to those who need it most and each ShelterBox supplies an extended family with a tent and essential equipment to use while they are displaced or homeless. When we know where it was deployed we’ll update you!